Francis Thynne (1545-1608), was a herald and antiquarian who was well connected to the major figures of the Elizabethan age. In the 1570's he developed a particular interest in alchemy. 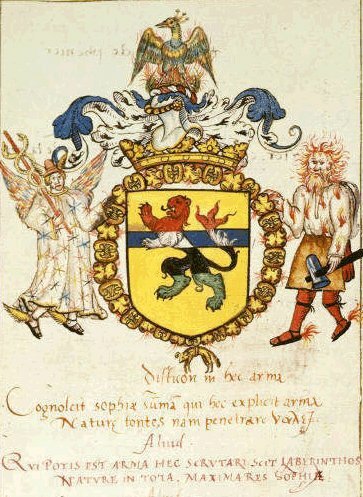 He combined this with his knowledge of heraldry to create his 'Insignia Philosophorum', essentially a coat of arms for alchemical philosophers. He depicted this in a notebook which has survived in the Bodleian Library as part of Ms. Ashmole 766, where he wrote an extended poem The Discourse uppon the Philosophers Armes. This is an extended alchemical allegory on the metamorphosis of metals. His arms of the alchemical philosophers show a shield fess, that is divided with a band. The shield has a golden ground on which is depicted a lion rampant. The band of blue cuts across the body of the lion, so this is shown in four colours. The upper part, head, arm and tip of the tail, are in red; the middle body and middle part of the tail are in white; the lower part of the body and tail are in black; while the legs are in a silvery grey. These are the main colours found in the alchemical process, the blackening, the whitening and the reddening. The shield is placed within the circular insignia of the Golden Fleece, we see the links of its golden chain and the familiar image of the ram suspended by a band around its middle. The classical myth of Jason and the Golden Fleece was often used by alchemists. Above this is a golden crown, and set above the helmet is a rainbow coloured peacock with the three plumes on its head. It is not realistically drawn, and as it appears to be seated on fiery flames, it has something of the quality of a phoenix. An important stage in alchemy preceding the formation of the tincture is called the Peacock's Tail as the substance in the flask then undergoes a series of rapid colour changes. Perhaps here Thynne is hybridising the two bird symbols, but we would probably have to have access to his allegorical poem to understand exactly what he intended. The central shield has two supporters. On the left we see the winged figure of the God Mercury with caduceus and winged helmet and sandals. On the right is Vulcan the god of fire, dressed as a blacksmith, but with a shirt set with flames. His hair and beard are also aflame. He holds his forging hammer and we see flames at his ankles, mirroring the wings on Mercury's feet.